Escape to a land far, far away from where you'll undertake magical quests set by the fairies, goblins, and elves to find the magic key that unlocks the secrets of the forest. 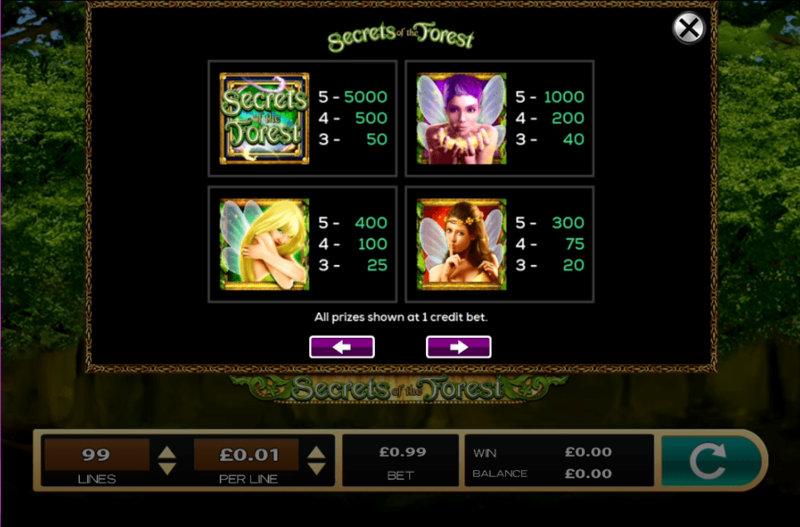 Secrets of the is a 5 reel, 99 payline 3D slots online with a fairytale theme. You'll be among all of the magical creatures of the land as you explore to find the secrets that lie deep into the forest. The design is truly whimsical with lots of glowing lights, fairies, and glittering fairy dust. There are some great features with Secrets of the Forest including wilds, scatters and a tumbling feature. 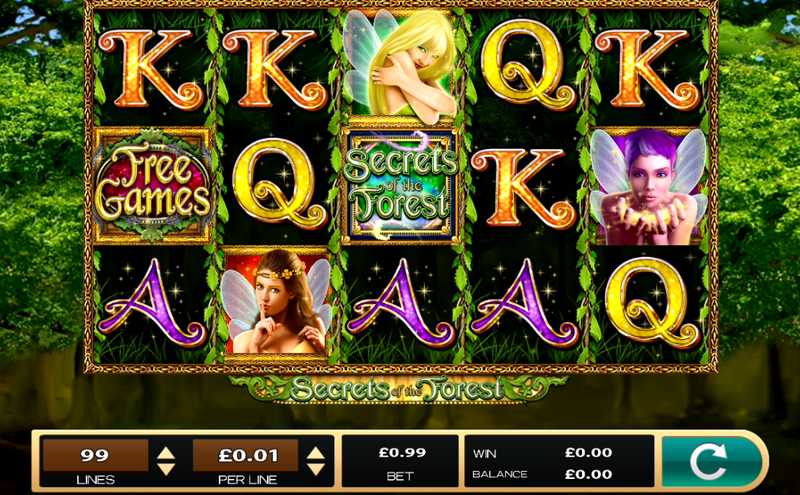 Secrets of the Forest is a fairytale-themed slot developed by IGT with a beautiful fairytale theme. Join the 3 fairies as they embark on an adventure to unlock the hidden secrets of the forest in order to access rare jewels and treasure that lies under the mystical talking tree. Behind the reels, you'll see the enchanted forest filled with leafy green trees surrounded by a magical golden aura. Symbols include 3 fairies; one with brown hair wearing a flower crown, one with long blond hair and one with an adorable pink pixie cut. Other symbols include glittering pastel coloured playing card symbols. Searching for more games? Check our guide for the best slot games to play with amazing themes. The Wild Symbol - The wild symbol is the word 'WILD' and replaces all other symbols to form winning combinations. The wild also only appears on reels 1, 2 and 3. Tumbling Reels - All winning symbols activate the tumbling reels feature. Once activated, all symbols created in a winning combination will disappear. The empty places will now be filled with new symbols which tumble from the above. This gives you an exciting opportunity to give you more great wins! The reels continue to tumble on the same spin until you have no more wins. Free Spins Feature - Landing 3 free spins symbols will unlock the free spins feature. Free games are now played on all 99 paylines which gives you plenty of opportunities to create magical wins. If you're looking for a fairytale adventure then you have come to the right place. You'll get to live out your fairytale dream helping fairies unsolve the mysteries of the forest. Secrets of the Forest has a stunning girly and glittery design and the perfect sparkly soundtrack to match. The tumbling reels feature is perhaps the most exciting as you get to see the reels shake-up to create even more wins. Or head to the pyramids in Egypt with Ancient Egypt Classic.